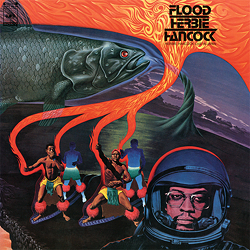 ﻿In the summer of 1975, the Herbie Hancock Sextet made a hugely successful tour of Japan, which made people aware of a 'new' Hancock. The last LP that the keyboard virtuoso had recorded, "Thrust", was already one year old, and the film music for the Charles Bronson classic "Death Wish" was received negatively by his fans. At his concerts in Tokyo, Herbie Hancock reached back to his hits: "Maiden Voyage", "Chameleon", and the famous, soulful "Watermelon Man" made the fans at his concert hall and open-air appearances go wild with enthusiasm. Forty years later I have the courage to confess that I couldn’t have cared less about this music at the time; in Europe there was enough that was new and exciting to see and listen to. However, this re-release in its original format has given me the opportunity to check out whether this music has withstood the test of time. And I must say: it has passed the test! Just listen to Herbie at his best!